The second of two day 1s ran on Saturday for the 2018 Saskatchewan Indian Gaming Authority (SIGA) Poker Championship, and 2014 winner Chris Bowers set himself up to make a solid run at repeating this year by building a massive stack throughout the day. He was the only player from either Day 1 who found more than 400,000 chips, and goes into Sunday's Day 2 as the odds on favorite. The $675 tournament is SIGA's premier poker event every year, and offers players a starting stack of 30,000 chips to play 30 minute blind levels. Day 1a of the event, which ran Friday, saw 134 entries with 24 players still active at the end of 16 levels. Saturday's Day 1b always draws a larger crowd, and this year was no different as 232 entries were recorded by the time late registration closed. When all the cards were dealt on Day 1b, 47 players were still around to bag up their chips for Day 2. The undisputed chip leader for both Day 1s is Chris Bowers, who powered through the latter stages of the day to amass an impressive stack of 413,000. Two other players from Day 1b managed to build a bigger stack than Day 1a chip leader Joe Bohl. Bernard Elevado bagged 377,000 while Daniel Lefebvre ended up with 319,000 chips. 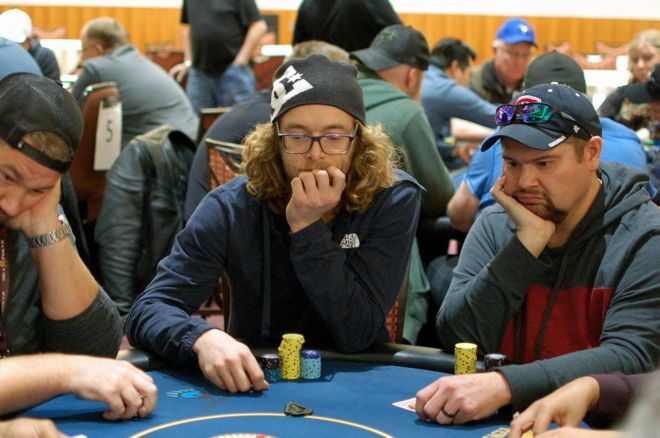 Among the other notables to bag chips at the end of Day 1b were Troy Nisbet, Justin Skamanis, Dylan Ellis, and Sunny Lubana. The full list of players to advance to Day 2 on Saturday is below. With the 24 players who made it through Day 1a, there will be 71 players, out of a total field of 366, returning to the felt on Sunday for Day 2. Action kicks off at noon with the start of Level 17 and players will all be looking for one of the 55 paid spots. PokerNews Canada will be on the floor all day to bring you the action.